Looking to improve your business efficiency and organization? 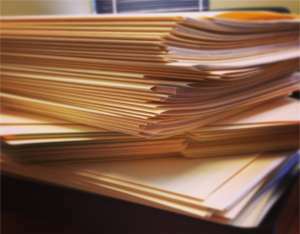 Do you look at a room filled with folders and filing cabinets and wish there was a better way to keep records of all the important documents for your business? If so, there is an answer. Document Management Systems. It is a proven method for organizing and maintaining your documents so that you have easy access to them and can find the document you need when you need it. Plus you don’t have to take up an entire room (or rooms) with filing cabinets. The only solution is to eliminate the mess, the filing cabinets, get organized so you can find the documents you need, improve your document management workflow, and transform the chaos into an ordered and structured system. That’s the essence of electronic Document Management. Mission Critical Systems is based in Denver and we offer a wide range of IT services in Colorado as well as across the nation. We’ve successfully implemented document management solutions nationwide for a wide range of firms in many different industries. We approach each project from a consulting perspective– matching one of our 3 solutions to each specific set of requirements and budget. Documents Management systems can transform a business by correcting errors, promoting collaboration, and minimizing time wasted searching for information. It is essential to creating meaningful document retention policies and creating good Knowledge Management. Effective Business Document Management incorporates the storage, easy finding, protection and retention of documents and other content such as emails. Properly created and deployed, a Document Management system gives authorized users the ability to efficiently find, work on, distribute and protect any substantial document relating to their role in the organization.